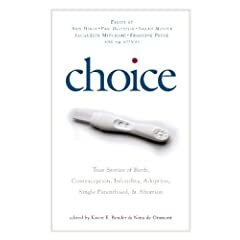 I went to Bluestockings last week to hear from the two editors and one contributor to this new book called Choice. It originally intrigued me because I thought it might be a broader take on what the term choice means for people in the United States. While I haven’t read the whole book yet, from the three contributions read last week and the editors remarks, it expands the concept of choice, but not as far as I would have liked. As a young queer woman, I didn’t feel particularly reflected or included in their stories, and from scanning the titles of the other essays, and looking at the biographies of the other contributors, didn’t feel compelled to keep reading. While I think the book itself provides some interesting, thoughtful and well-written perspectives on what choice can mean for women, it misses an opportunity to really provide something new. I feel disappointed by these kind of publications frequently, and maybe that’s because of who is able to access publishers and agents, and who is in their circle of writers. It’s difficult for new writers (or even people who wouldn’t consider themselves writers, but have amazing things to say) to get publishedor included in these types of manuscripts. I obviously need to read the rest of the selections to really be able to give my opinion, but in the meantime, you can check out this (kind of scathing) review of the book at SFGate. For more from one of the editor, check out Karen Bender’s article at Huffington Post. Previous Article What do doulas and the Red Sox have in common?